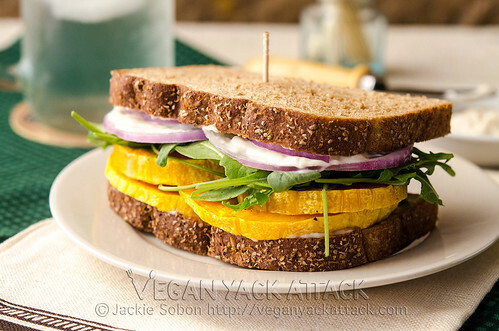 A flavorful and easy Garlicky Butternut Squash Sandwich made with vegan garlic mayo, arugula and toasted bread! I’m a little worried, and it’s probably not what you think. I may or may not be addicted to sandwiches. Of course, there are worse problems to have, but I used to be indifferent to the carb-loaded, tasty meals. If I saw one that looked good, I’d go for the wrap (which are also very good) without a second thought. Now, I’m stuffing whatever combination of foods I can between two toasty slices of bread to see what I can come up with. What makes sandwiches so appealing is that they are pretty low-maintenance, relatively easy to eat (depending on how large you make it), and damn delicious. With all of the recipes that I’ve been making for the Great Vegan Pumpkin eBook and the Fall Vegan Cuts eBook I’ve been low on time for much else, and this sandwich really hit the spot. In it are a few of my favorite things: Arugula, Garlic, Vegenaise, and obviously, Butternut Squash. These ingredients are easy-to-find and (mostly) healthy! Although, after all of the squash that I’ve been eating I may turn orange. But, I digress, the warm, roasted butternut squash against the peppery arugula and toasted bread create a wonderful world of flavor and texture. Go ahead and throw some Roasted Garlic Vegenaise in that bad boy and you’ve got yourself a party! Preheat oven to 400ºF. Get a baking sheet out and line it with parchment paper or a silicon mat. Take your peeled Butternut Squash and cut a 1/2" thick slice out of the bulbous bottom, width-wise. Scoop the seeds out of this slice as well as the rest of the squash. Continue cutting the squash into 1/2" thick slices and place them on the baking sheet. Take the coconut oil (with your fingers or a brush) and spread a very thin layer on top of each squash slice. Sprinkle roughly a 1/4-1/2 tsp. of sea salt over the slices along with some black pepper. Bake for 30 minutes. When the squash is done baking, let it cool for 3-5 minutes, while you toast your bread. Next, spread 1 1/2 tsp. of vegan mayo onto each slice of bread. Divide the butternut squash slices and stack them onto two pieces of bread. Carefully pile 1 cup of arugula onto each squash base, then the red onion slices. Top with the remaining bread and enjoy! Mmmm… sammiches. A former roommate asked me the other day if I still don’t eat cold sandwiches. The answer is I don’t; my sandwiches must be heated. Wow Jackie, that is one beautiful sandwich! I love butternut squash, but I don’t like on its own as long as it has spices and garlic. Mmmm, garlic vegenaise is so good! Have you tried the garlic aioli by Wildwood – it’s downright garlicky and delish! I love sandwiches (I love wraps too). sandwiches are just so good. this one looks amazing – and I LOVE arugula! This is glorious! Butternut squash is the perfect food…and the perfect food to convince veggie-phobes that it’s not so scary to take the plunge to veganland! Love it – thanks for sharing! Yum, I love the idea of squash on a sandwich!